Low Star(1★/2★/3★) servants you should train. Browse worthwhile Low Star servants by category. Check out our 1★/2★/3★servants before you train them. His first skill [Guardian Knight A+] will draw enemies' attacks to himself. As a result, you can minimize damage received by allies if Georgios takes most of the attacks. Even if the skill level is not yet developed, you can already start using it effectively. Although it is difficult to survive 3 turns when your HP are low, but you can still benefit a lot from using Georgios in combination with other servents. ▲In case Georgios dies in the battle, which is more likely to happen on lower levels, choose a craft essence, that takes effect after a servant’s death.. Combining Georgios's NP [Ascalon] with Siegfried will bring you pretty good results. Since Siegfried can deal an extreme amount of damage to [Dragon] enemies, the combination of two may come in handy. If you could pick up Siegfried in the early stages, training him is definitely worth it. Has a self-target [Defence UP] skill that can minimize received damage by half for 1 turn. In addition, has an ability to grant your servants immunity for a single attack. His third skill [Attack UP] can can provide your allies with a good support. Although this is not something that you have to worry about unless you are familiar enough with the game mechanics, but using servants who have 3 Arts cards has its strengths. 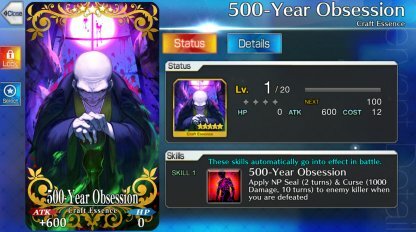 By using him alongside servants based on Arts cards, you will have more chances to trigger chain attacks gaining NP faster and dealing more damage. Tristan 4★, just like David 3★, has an ability to grant allies immunity, but both are worthwhile to be trained. The greatest thing about Amades’s 1st skill is that you can gain 20 critical stars. The amount of stars gained increases by 3 with each level. You can get 50 of them once the maximum level is reached. Thus, your allies will get a huge amount of criticals stars and gain NP much faster. Another strength is a 1 turn enhancement of Arts cards. It varies from 22% on level 1 up to 44%(MAX level). It also helps with NP gaining, which makes this ability more valuable. You will experience a long cooldown unless you raise the skill level. You will have to use rare materials to level up. As Amadeus’s attacks are weak, good timing means really a lot here. Since there are a few more things to consider, it might be a good idea to keep Amadeus for later, in case you do not have a strong friend as a main attacker. His second skill gives 10% NP boost (30% max lvl). It is possible to trigger NP instantly when combined with the right Craft Essence or Servants. As a berserker with a powerful NP he is good against any class. Clear enemy waves just by leveling up or using ATK Fou on Blaze or Vault. He is quite versatile on Event quests. If your enemy has got HP lower than 30000, taking one down will not be a problem. He has a lack of survivability due to the slow HP recovery and reliance on [Guts]. In the early stages can be used as a low-cost attacker when necessary. Still, since his max HP are pretty low, you might get into trouble unless you have some defence elements. You might have to go over [Rank Up Quest] multiple times to gradually upgrade this servant. Even if you are going to use him for farming purposes, you will have better results after his Ascension is maxed out. Alike Spartakus his third skill boosts HP by 20% (30% max lvl). It is also possible to trigger NP instantly when combined with the right Crafting essence or servants. His multi-target NP is relatively strong and easy to be triggered several times in a battle. One thing you have to keep in mind is that he does not perform well as a fighter himself. After NP deathrattle he will bring the next servant into the fight without a need for order change. Like Spartakus it is best to take him through [Rank Up Quest] for a couple of times. As he also works best when the Ascension levels are maxed out, you might want to avoid making this servent your top priority. Good durable as he can grant immunity at the 1st Ascension. The great thing about Cu Chulainn (Proto) is that necessary for Ascension materials are easy to get and he can be used efficiently for farming after training is completed. Although you have to rely on luck a lot while playing this servant, he could be trained as your first attacker. Increase Skill and Class levels for the best results. Can grant immunity to allies after the 1st Ascension. He can easily gain extra Critical stars when you put his Quick cards in the back of a card chain. Will later learn a debuff skill that increases chances of applying negative effects such as [stun]. Extremely durable in a battle due to [Guts] and immunity granting skills. Lines up well with Cu Chulainn (Proto) because of their chain attack. While it is worth upgrading Ascension more than 2 times, gathering necessary materials for upgrades might be bothersome in the early stages. Similarly to Cu Chulainn (Proto) has a high value due to his ability to grant immunity starting from the 1st Ascension. In the early stages it is easy to keep several Cu Chulainn servants alive, thanks to their high survivability. They are also a good choice to counter assassins in Main capture 4. Her NP deals tons of damage to all male servants. Can be used against a vast variety of enemies. Efficiently focus single male servants with her skills (《Charm [Male]》,《decrease charge》) and NP. Some main story quests like Capture 6 will not seem that difficult anymore with Euryale. His NP can deal even more damage to poisoned enemies rather than some 5-star servants do. Moreover, it is really easy to get enemies poisoned by his 1st skill. Would be a nice choice in case you do not have Euryale. Because she got one of the most powerful NPs among all other servants, performs well against against [?] class servants when farming on Story Quests. Good choice when you do not have a rider with single-target NP of level 2 or above. With surprisingly effective single-target NP and gauge charging skill he is a good attacker that fits well for farming purposes. Additionally, her skill that rises up defence of all allies cannot be underestimated. Both of these skills become a game changer even on level 1. Unfortunately,it is tough to raise NP level, since she is not available in story summon untill you have cleared capture 6. As most sabers with a single target NP are usually high rarity servants, except hard-to-get Bedivere, he is the only low rarity saber who fights effectively against bosses. After a bit of training becomes helpful in Main Story Quests as a support. Comparing to Bedivere, his NP level is easier to raise. There are not many low rarity lancers whose NP targets all enemies. He has [Guts] and [Increase Buster] supportive skill that can be applied on a single ally. In case you do not have a high star lancer with a multi-target NP, you may find him useful due to his effective NP and decent stats. Although you have to rely on your luck at some point, Andersen is a support who can buff all allies significantly. If your party is based on Arts Cards, Andersen's NP can be used continuously. Despite his low rarity, he will contribute a lot to the long fights. Bsides his NP being useful regardless of an enemy class, he possesses [Star Gather] skill. Consequently, it is best to combine him with supports like Zhuge Liang or Merlin. He is remarkably effective in combination with other servants rather than fighting alone when it comes to farming on quests with bosses. Having an excellent supportive skill that buffs all Busters (by 40% MAX), he is also able to increase an ally NP gauge by 20%. Fits well for clearing waves of enemies before fighting a boss, as his NP can deal a huge amount of damage and critical stars can be easily gained. An easy to use Berserker,whos NP deals a lot of damage even when you do not use ATK Fou. It is possible to use him for weakening bosses and leave all the rest to a sub-member. After using NP you can cust [Defence Down] to a single enemy. Buffs attack of allies and enhance Quick cards. Can gain critical stars with the help of NP. Use NP during the first couple of waves to deal critical damage to bosses on the last wave. Can also be considered as a support. Low rarity Saber with multi-target NP. He is not that good for farming because of the lack of HP. On the other hand, the amount of his damage can be even greater than ★4 Saber can deal as if an enemy got [Defence Down] and your attack is buffed. His NP is also easy to reach level 5. While not being a strong attacker, he is able to gain NP fast due to his skill. After raising the skill level you can seek to use NP for 2 turns in a row, which might be particularly useful against the large number of enemies. Custer-attacker with multi-target NP. Would be a nice choice when fighting against assassins on quests. 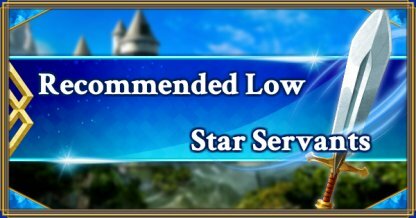 Since his ATK is low, you should aim to gather critical stars and use his powerful multi-target NP, after completing Rank Up Quests, so that he will become more efficient for farming on quests with assassin-bosses. Archer with multi-target Special Attack [Demonic] NP. Besides crashing Demon enemies, can stand against various classes because of the mighty NP. Can be taken instead of a high star servant due to the high efficiency. In addition to having multi-target NP, his skill charges NP gauge by 20%. In combination with the right Craft Essence NP can be triggered instantly. Take advantage with TreasureVault(Expert) when farming on quests with enemy custers. Ability to apply Skill Seal (100% success) and charm multiple enemies with NP is her strength. Despite the low probability rate, her other skill can charm all male enemies. She will cause a lot of trouble to male enemies on a guest. Since she is also able to reduce enemy stats, can be considered as a support as well. His NP has a high chance to debuff enemy attack/defence. Being able to debuff an enemy ATK/DEF by 50～60％ , Asterios can ease the damage given to party members and significantly increase the attack of allies during the same turn. The defence and attack stats are quite good for a 1★servant. However, because it takes longer for him to gain NP, you might want to think over your party members. Can apply NP seal, Stun to all enemies and Skill seal to an individual enemy, which are a lot for a low rarity servant. Nevertheless, since those abilities are probability rate dependent, you cannot rely much on them. You may use him to protect other servants, as he has a self-target skill with a high chance of applying Defence UP. Both skill and NP are self-target types. Thanks to [Increase NP gauge Gain], the more damage you get from enemies, the more NP points will be added, consequently you will get more chances to grigger NP. Since you will pretty much use only his self-target abilities, it is fine to have this servant remain at level 1. Despite dealing high damage, his NP removes all buffs from enemies. Depending on skills and cards his value is in easy-to-trigger NP. Thus, your choice of servants and craft essences can have an influence on NP usage frequency. Has got a special skill which applies Inflict Nullify Buff (3 times) to an enemy. Although he cannot remove already granted buffs, he is still able to significantly spoil your enemies' life. With 3 Arts Cards in inventory performs well on high difficulty quests in addition to having enemy NP gauge reduction. Complete the 1st Ascension and Bond Lv1, clear 3rd Singularity to unlock Interlude. In order to unlock Interlude quest for Edward Teach, you have to complete the 1st Ascension, reach bond. lvl 1 and complete Capture 3. You will get 10 Forbidden Page as a reward. Since this item is essential starting from the early stages, it is worth leveling Edward Teach up a bit to get those 10 pages.